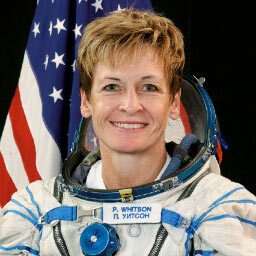 Attendees at the NAB Show yesterday witnessed the first 4K UHD transmission from space when NASA astronaut Peggy Whitson was interviewed from the International Space Station. The transmission was enabled by TV technology provider AWS Elemental, whose CEO, Sam Blackman, conducted the live interview during a panel session called ‘Reaching for the Stars: Connecting to the Future with NASA and Hollywood’. NanoRacks, a provider of commercial access to the International Space Station through its status as a US National Laboratory, helped certify a UHD-capable video encoder from AWS Elemental for launch. The encoder and a RED Epic Dragon digital cinema camera were delivered to the station onboard a Japanese cargo craft in December last year. “We spent about a year preparing for this,” said Keith Wymbs, chief marketing officer at AWS Elemental. “We did a lot of testing over the last three months in particular”. The transmission was encoded in HEVC at 12Mbps and reached the Las Vegas Convention Centre via the Johnson Space Centre in Houston, with a delay of about 10 seconds from its source 250 miles above the Earth. The video content was also distributed via the web using the AWS Elemental Delta delivery platform and AWS Direct Connect. In total, about 20,000 people globally saw the live transmission, according to Wymbs.